Lightly grease an 8-inch shallow baking dish. Remove crusts from the bread. Cut bread into small squares. Combine cheese, onions and seasonings. Arrange bread and seasoned cheese in layers in baking dish. Have bread on bottom, middle and top layers. Combine eggs and milk. Pour over bread. Let stand 45 minutes or longer. Place baking dish in pan of hot water. Bake about 40 minutes. Serve immediately. Available via Amazon.com This recipe is from the classic cookbook titled Minnie Pearl Cooks (Minnie Pearl, Nicholstone Bookbindery, 1970). 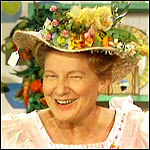 Minnie Pearl was a country comedienne who was famous for her appearances at the Grand Ole Opry and on the TV show Hee Haw. Minnie's actual name was Sarah Ophelia Colley Cannon. 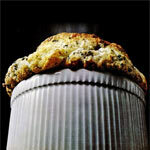 Her cook book is chuck-full of good county cookin' recipes which includes a nice variety of breakfast dishes. From the preface of Minnie Pearl Cooks: "Howdeeee! Food has always represented fun to me. There were five daughters in our family and we enjoyed all of our meals together - no TV trays in those days! And mealtime was fun." 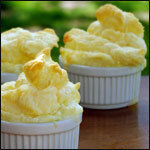 What do you think of Mock Cheese Souffle? Heat one can of cream of mushroom soup and add 1 cup of sour cream. 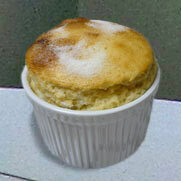 This sauce is very good when served on the souffle.